Very few people set out intentionally to ruin an antique, but people regularly make costly mistakes every day when caring for antiques. Why should this be so? In most cases it is simply because they do not know any better, or they follow old wives tales and old fashioned handed down methods. Not everything old is good and not everything modern is bad. The technology developed to put a man on the moon and oil platforms into the North Sea, has become available to us for use in our everyday lives. The following is a list of the five most common causes or reasons why antiques become ruined. In general cleaning antiques makes them more desirable and valuable, but care must always be taken not to destroy that much desired surface finish known as patina. Patina can be defined as a surface appearance on something grown beautiful especially with age or use. Just like a good wine where the taste will mellow and improve with age, so similarly with the surface of an antique where it will develop a deep lustre that comes from years of cleaning and usage. Do not confuse patina for a dirty, oxidised or tarnished surface. Both copper and bronze will form a green film when exposed to atmospheric pollution, especially acids. Whilst that green film may look nice on a church roof, it is extremely doubtful that it would be appreciated on an antique copper or bronze piece used in the home. Before attempting to clean your antique, seek advise about how cleaning will impact the value. Our general rule of thumb is to restore an item to the condition in which it was originally used. Before attempting to restore an item, seek advise. Restoring an antique to its original glory might seem like a good idea, and sometimes it is, but unless you have the skills and knowledge leave the job to a professional. Almost all materials will deteriorate when left in direct sunlight, so place your antique or collectable piece with care. Paper, including photographs, will yellow and crack, the vibrant colours in textiles, oil paintings and watercolours will fade and furniture will crack and discolour if displayed in direct sunlight. Take care to display your antiques and collectibles in dimly lit areas or for short periods of time in sunny rooms. 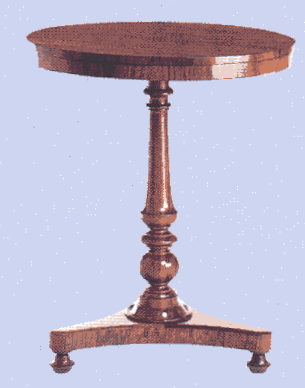 In general the least done to an item the better, so before attempting to refinish an item seek advise. More common pieces can be refinished but do the research before you start the job. If you happen to have a rare antique, or maybe even a furniture masterpiece under no circumstances attempt to refinish the piece otherwise you may end up with an expensive pile of firewood. 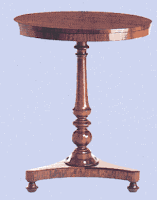 The table shown was refinished and the original patina removed which consequently reduced its value by over 50%. A museum setting in our homes would be the ideal environment for our antiques and collectibles. In most instances that is not possible, so we have to do the best we can with what we have and be mindful of proper storage in order to preserve an item for posterity. Keep heirlooms out of unusually damp areas like basements and overly hot areas like attics, if at all possible. Do not hang paintings on cold walls especially north facing walls. The rule of thumb to apply when storing your treasures is whatever is comfortable for you is likely to be comfortable for them.